2 A. GOALS AND CREDIT OBJECTIVES RCTC s goals and credit objectives are to: Serve the people of Riverside County in the fulfillment of RCTC s policy and transportation objectives; Comply with all State and Federal laws and regulations governing the issuance of debt; Promptly repay when due the principal and interest on all debt issued and outstanding; Implement debt programs with the highest possible credit ratings which provide the necessary flexibility in order to achieve the lowest possible borrowing costs on RCTC s debt obligations; Ensure that RCTC s debt proceeds are invested in safe, liquid and secure investments that earn competitive market rates of return in accordance with RCTC s Annual Investment Policy and indenture; Ensure that RCTC does not take any action regarding the use of the debt proceeds that would cause the interest on any tax-exempt debt to be included in gross income for purposes of federal income taxation; Establish policies and procedures for participation in RCTC s debt financing; Hold debt financing participants accountable to such policies and procedures; Reward adherence to RCTC s policies and procedures and good performance by the debt financing participants with continued participation in RCTC s debt financing program; Explore and implement innovative structuring ideas when they are prudent and consistent with the statements listed above; and thus Protect the funds that Riverside County taxpayers have entrusted to RCTC. B. CREDIT RATING OBJECTIVES RCTC seeks to obtain and maintain the highest possible debt ratings while at same time providing the appropriate and necessary flexibility in its bond financing documents. Sales Tax Revenue Supported Debt For debt secured by a senior lien on revenues of the Measure A sales tax, RCTC currently maintains an Aa2 rating from Moody s Investors Service (Moody s), an AA+ rating from Standard and Poor s Ratings Group (S&P), and a AA from Fitch Ratings (Fitch). For debt secured by a subordinate lien on revenues of the Measure A sales tax, RCTC currently maintains for its commercial paper notes a P1 rating by Moody s and an A1+ by S&P. The senior lien debt and subordinate lien debt, collectively, are sales tax revenue supported debt. RCTC will support the Measure A program, in part, by the issuance of sales tax revenue supported debt As of March 31, 2013, RCTC has the following sales tax revenue supported debt outstanding under the 2009 Measure A: 1. $185,000,000 Sales Tax Revenue Bonds, Series 2009 A, B and C, with a total outstanding balance of $161,400,000; 2. $120,000,000 Commercial Paper Notes Program, 2005 Series A and Series B, with a total outstanding balance of $40,000,000; and 3. $150,000,000 Sales Tax Revenue Bonds, Series 2010 A (tax-exempt) and B (taxable), with a total outstanding balance of $150,000,000. 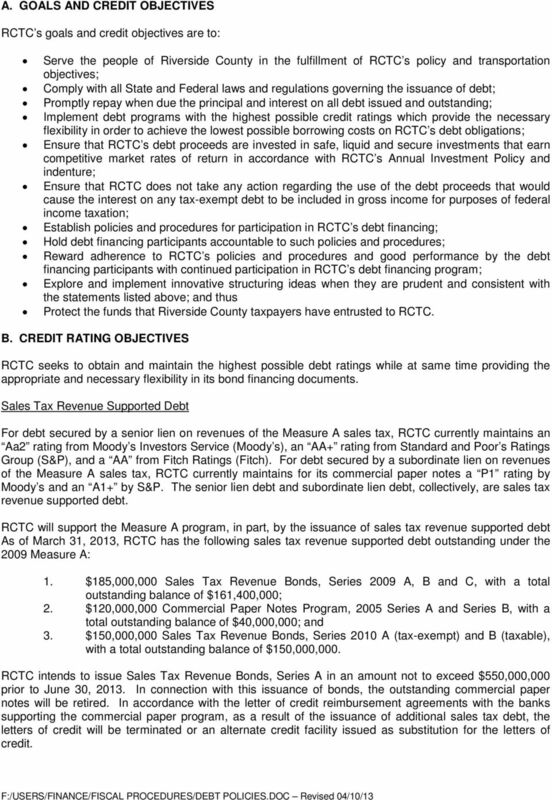 RCTC intends to issue Sales Tax Revenue Bonds, Series A in an amount not to exceed $550,000,000 prior to June 30, In connection with this issuance of bonds, the outstanding commercial paper notes will be retired. In accordance with the letter of credit reimbursement agreements with the banks supporting the commercial paper program, as a result of the issuance of additional sales tax debt, the letters of credit will be terminated or an alternate credit facility issued as substitution for the letters of credit. 3 Toll Revenue Supported Debt For debt secured by a lien on toll revenues ( toll revenue supported debt ), RCTC intends to maintain investment grade ratings from Fitch and/or S&P. RCTC will support the toll program, in part, by the issuance of toll revenue supported debt derived from one or more toll facilities or projects. Such debt may be in the form of toll revenue bonds or federal credit assistance. Prior to June 30, 2013, RCTC intends to issue bonds and receive federal credit assistance as follows for the toll program: 1. Toll Revenue Bonds, 2013 Series A (Current Interest Bonds) and Series B (Capital Appreciation Bonds) in an amount not to exceed $400,000,000 related to the 91 Corridor Improvement Project; and 2. Transportation Infrastructure Finance and Innovation Act (TIFIA) Loan from the U.S. Department of Transportation in an amount not to exceed $451,000,000. 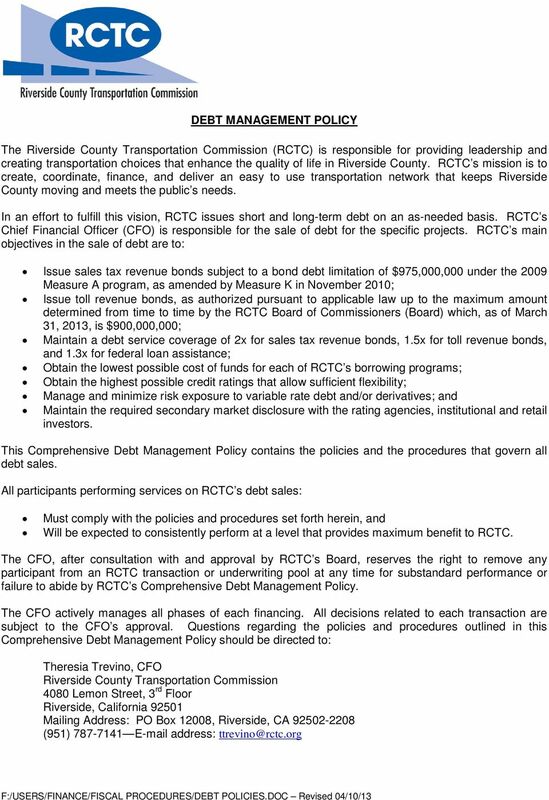 C. SELECTING THE APPROPRIATE METHOD OF DEBT SALE It is in the interest of RCTC to sell its public debt using the method of sale that is expected to achieve the best sale results, taking into account both short-range and long-range implications for Riverside County taxpayers. The CFO will advise the Board of the most appropriate method of sale in light of the prevailing financial, market and transaction-specific conditions. D. APPOINTMENT OF A FINANCIAL ADVISOR The CFO, with the approval of the Board, may select a financial advisor to assist in the issuance and administration of RCTC s debt. The services of the financial advisor may include, but are not limited to: Monitoring all fixed income markets, Evaluating proposals submitted to the CFO, Analyzing the costs and risks of debt issues, Reviewing the structuring and pricing of debt issues, Developing and maintaining the time and responsibility schedule, Advising on terms and conditions of credit facilities dealing with the issuance of variable rate debt, Assisting in the preparation of official statements, and Preparing and reviewing presentation materials for rating agencies, investors and insurers. The services of a financial advisor will be obtained through a competitive evaluation of proposals. The criteria to be used in evaluating and selecting a financial advisor include: Experience in providing formal financial advisory services, Experience with diverse and complex financial structuring requirements, Experience and reputation of assigned personnel, and Fees and expenses. RCTC s financial advisor will provide RCTC with objective advice and analysis, maintain the confidentiality of RCTC s financial plans and be free from any conflict of interest as defined by the: CFO and all California statutes and regulations governing financial advisors. 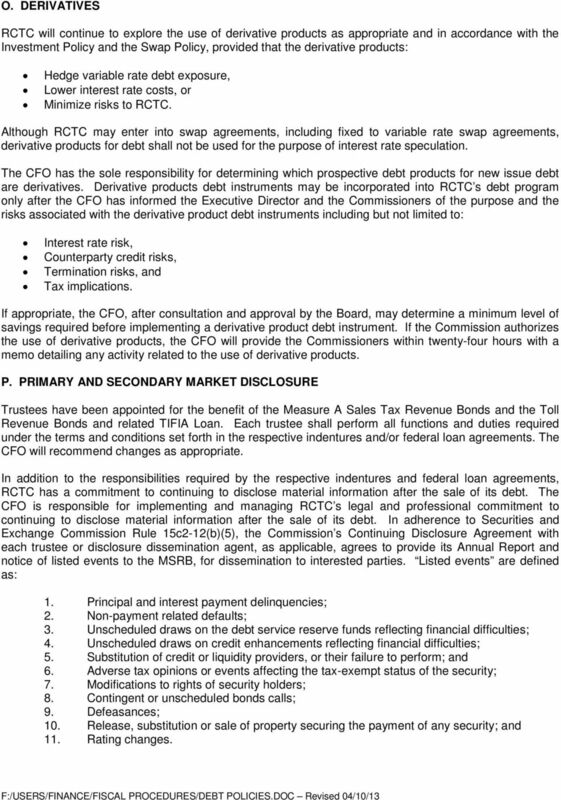 RCTC s financial advisor may not participate in any of RCTC s syndicates in the sale of debt. 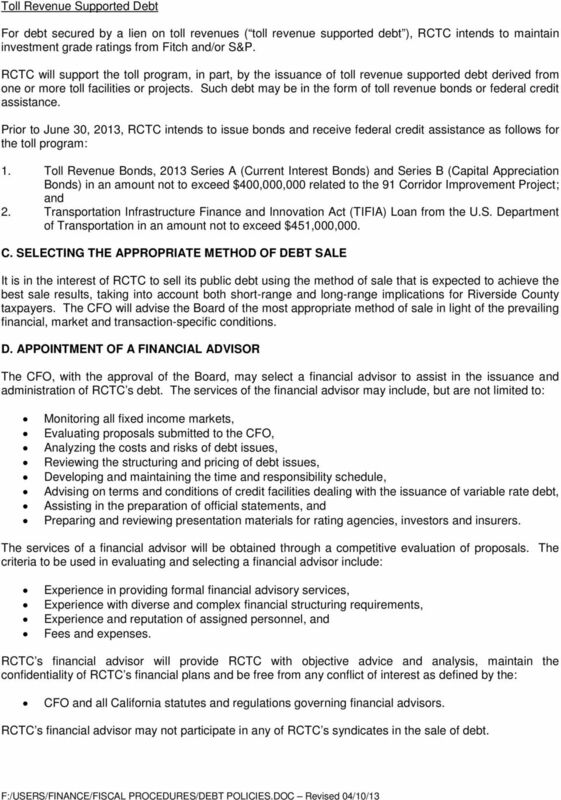 4 E. APPOINTMENT OF LEGAL COUNSEL The CFO, with the approval of the Board, must select legal counsel, including bond counsel and disclosure counsel, and engage RCTC s general counsel, to assist in the issuance of RCTC s debt. 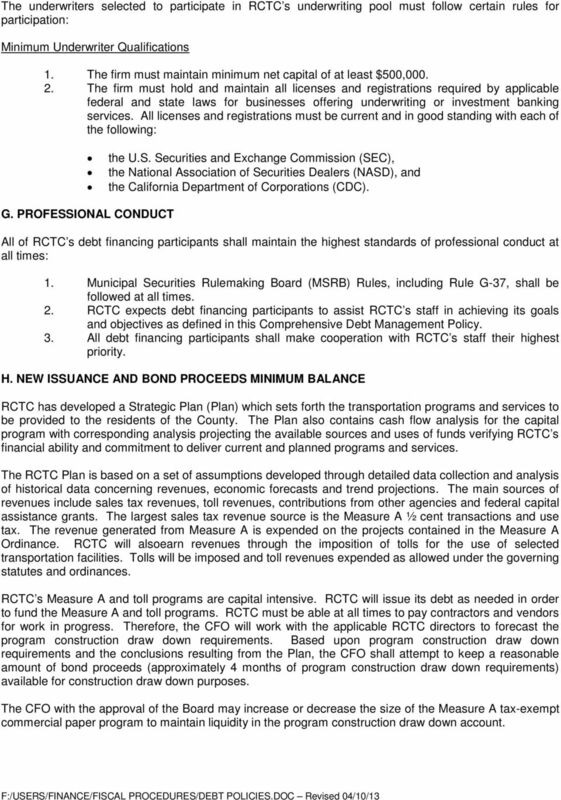 All debt issued by RCTC must include a written opinion of bond counsel affirming that RCTC is authorized to issue the proposed debt, that RCTC has met all the constitutional and statutory requirements necessary for the issuance of the proposed debt and a determination of the proposed debt s income tax status. This approving legal opinion and other documents relating to the issuance of the proposed debt must be prepared by a nationally recognized private legal counsel with extensive experience in municipal finance and tax matters. 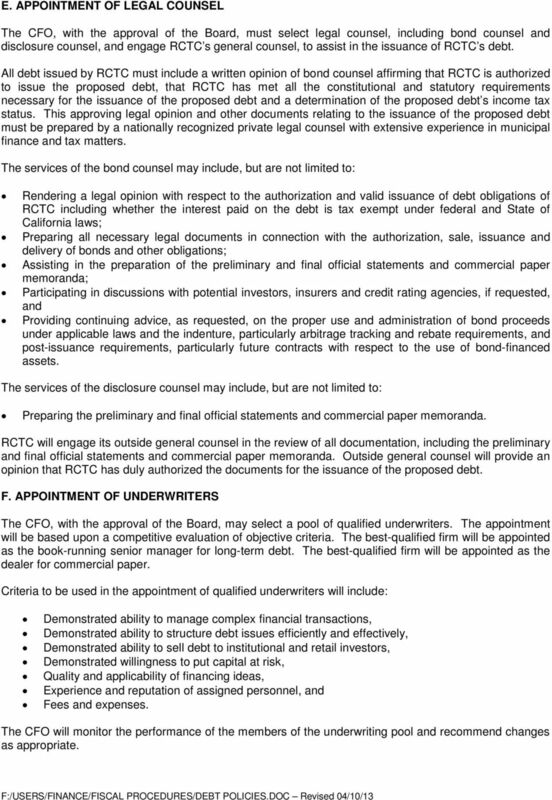 The services of the bond counsel may include, but are not limited to: Rendering a legal opinion with respect to the authorization and valid issuance of debt obligations of RCTC including whether the interest paid on the debt is tax exempt under federal and State of California laws; Preparing all necessary legal documents in connection with the authorization, sale, issuance and delivery of bonds and other obligations; Assisting in the preparation of the preliminary and final official statements and commercial paper memoranda; Participating in discussions with potential investors, insurers and credit rating agencies, if requested, and Providing continuing advice, as requested, on the proper use and administration of bond proceeds under applicable laws and the indenture, particularly arbitrage tracking and rebate requirements, and post-issuance requirements, particularly future contracts with respect to the use of bond-financed assets. The services of the disclosure counsel may include, but are not limited to: Preparing the preliminary and final official statements and commercial paper memoranda. RCTC will engage its outside general counsel in the review of all documentation, including the preliminary and final official statements and commercial paper memoranda. Outside general counsel will provide an opinion that RCTC has duly authorized the documents for the issuance of the proposed debt. F. APPOINTMENT OF UNDERWRITERS The CFO, with the approval of the Board, may select a pool of qualified underwriters. The appointment will be based upon a competitive evaluation of objective criteria. The best-qualified firm will be appointed as the book-running senior manager for long-term debt. The best-qualified firm will be appointed as the dealer for commercial paper. Criteria to be used in the appointment of qualified underwriters will include: Demonstrated ability to manage complex financial transactions, Demonstrated ability to structure debt issues efficiently and effectively, Demonstrated ability to sell debt to institutional and retail investors, Demonstrated willingness to put capital at risk, Quality and applicability of financing ideas, Experience and reputation of assigned personnel, and Fees and expenses. The CFO will monitor the performance of the members of the underwriting pool and recommend changes as appropriate. 5 The underwriters selected to participate in RCTC s underwriting pool must follow certain rules for participation: Minimum Underwriter Qualifications 1. The firm must maintain minimum net capital of at least $500, The firm must hold and maintain all licenses and registrations required by applicable federal and state laws for businesses offering underwriting or investment banking services. All licenses and registrations must be current and in good standing with each of the following: the U.S. Securities and Exchange Commission (SEC), the National Association of Securities Dealers (NASD), and the California Department of Corporations (CDC). G. PROFESSIONAL CONDUCT All of RCTC s debt financing participants shall maintain the highest standards of professional conduct at all times: 1. Municipal Securities Rulemaking Board (MSRB) Rules, including Rule G-37, shall be followed at all times. 2. RCTC expects debt financing participants to assist RCTC s staff in achieving its goals and objectives as defined in this Comprehensive Debt Management Policy. 3. All debt financing participants shall make cooperation with RCTC s staff their highest priority. H. NEW ISSUANCE AND BOND PROCEEDS MINIMUM BALANCE RCTC has developed a Strategic Plan (Plan) which sets forth the transportation programs and services to be provided to the residents of the County. The Plan also contains cash flow analysis for the capital program with corresponding analysis projecting the available sources and uses of funds verifying RCTC s financial ability and commitment to deliver current and planned programs and services. The RCTC Plan is based on a set of assumptions developed through detailed data collection and analysis of historical data concerning revenues, economic forecasts and trend projections. The main sources of revenues include sales tax revenues, toll revenues, contributions from other agencies and federal capital assistance grants. The largest sales tax revenue source is the Measure A ½ cent transactions and use tax. The revenue generated from Measure A is expended on the projects contained in the Measure A Ordinance. RCTC will alsoearn revenues through the imposition of tolls for the use of selected transportation facilities. Tolls will be imposed and toll revenues expended as allowed under the governing statutes and ordinances. RCTC s Measure A and toll programs are capital intensive. RCTC will issue its debt as needed in order to fund the Measure A and toll programs. RCTC must be able at all times to pay contractors and vendors for work in progress. Therefore, the CFO will work with the applicable RCTC directors to forecast the program construction draw down requirements. Based upon program construction draw down requirements and the conclusions resulting from the Plan, the CFO shall attempt to keep a reasonable amount of bond proceeds (approximately 4 months of program construction draw down requirements) available for construction draw down purposes. The CFO with the approval of the Board may increase or decrease the size of the Measure A tax-exempt commercial paper program to maintain liquidity in the program construction draw down account. 7 right to review and approve all fees and expenses and to request their substantiation. An estimate of the expense component of the underwriting gross spread must be submitted by the book-running senior manager to the CFO no later than one week prior to the pricing. RCTC expects the book-running senior manager to keep expense items and costs of issuance to an absolute minimum. In general, RCTC will not reimburse the book-running senior manager for clearance fees except for the Depository Trust Company ( DTC ) charge on issues that are registered in book-entry form only. RCTC will not reimburse the book-running senior manager for MSRB, Securities Industry and Financial Markets Association and California Public Securities Association expenses. There will be no consideration of an underwriting risk component of the gross underwriting spread until after the order period closes. At that time, the CFO and the book-running senior manager will review the book of orders and discuss the need, if any, for including an underwriting risk component in the gross underwriter s spread for unsold bonds. There will be no negotiation of the underwriting risk component of the gross underwriter s spread after the CFO has given the verbal award to the book-running senior manager. D. Marketing Plan Once the issue of debt has received its ratings and the credit enhancement, if any, has been determined, the book-running senior manager will provide to the CFO and the financial advisor its plan for marketing the issue. The plan will specify the sectors and specific customer types to which each maturity, group of maturities or type of bonds will be directed. In addition, the marketing plan will specify the efforts of the syndicate in advertising the issue and distributing notice of the issue to the market as a whole and the expected customers. E. Selling Groups The book-running senior manager will discuss with the CFO the advantages and/or disadvantages of using a selling group for the financing. 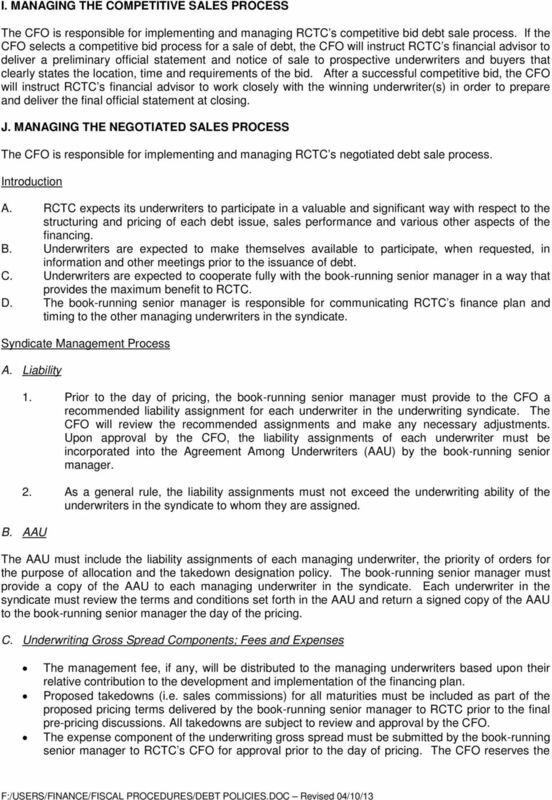 If the CFO decides to use a selling group, the book-running senior manager will provide a list of recommended firms for RCTC s approval at least one week prior to the day of pricing. F. Retention and Takedown Designation Policies The book-running senior manager will discuss the use of retention with the CFO at least one week prior to the day of pricing. During this discussion, the book-running senior manager will provide to the CFO the proposed retention amounts by maturity for each underwriter in the syndicate. If the use of retention is advised by the book-running senior manager and agreed upon by the CFO, the book-running senior manager will make retention amounts and maturities available to the underwriters as soon as possible prior to the day of pricing. Any change in the retention to the managing underwriters must be approved by the CFO prior to its release. At least one week prior to the day of pricing, the book-running senior manager must provide the CFO a proposed priority of orders for the purpose of allocation and a proposed policy for the designation of takedown on net designated orders. The policy must include a maximum percentage of takedown to be designated to any one firm, as well as a minimum number of firms to be designated on any one net designated order. It is anticipated that each underwriter in the syndicate will be allowed to place net designated orders on all RCTC debt sales. Upon approval by the CFO, the priority of orders and the designation policy must be communicated to the underwriters and included in the preliminary pricing wire. Any changes to the designation policy must be approved by the CFO and communicated to all underwriters in the syndicate and selling group members, if any, RCTC and the financial advisor. 8 G. Pricing Procedures At least one hour prior to the pre-pricing meeting or conference call (one business day prior to the day of the pricing) the book-running senior manager must deliver to the CFO and the financial advisor the proposed pricing terms. This is to allow for the thorough evaluation of the proposed pricing terms by the CFO. The list of the proposed pricing terms must include principal amounts, coupons, yields, optional redemption prices, and takedowns per maturity. One day prior to the day of the pricing, the book-running senior manager must initiate a prepricing meeting or conference call with the CFO and the financial advisor to discuss the proposed pricing terms, order period, underwriting gross spread components, market conditions and other necessary pricing information. A draft copy of the preliminary pricing wire must be provided to the CFO upon the completion of the pre-pricing meeting or conference call. Prior to its release, the preliminary pricing wire is subject to the approval of the CFO. The preliminary pricing wire must include, among other things, all pricing terms agreed upon by the CFO and the book-running senior manager during the pre-pricing meeting or conference call. 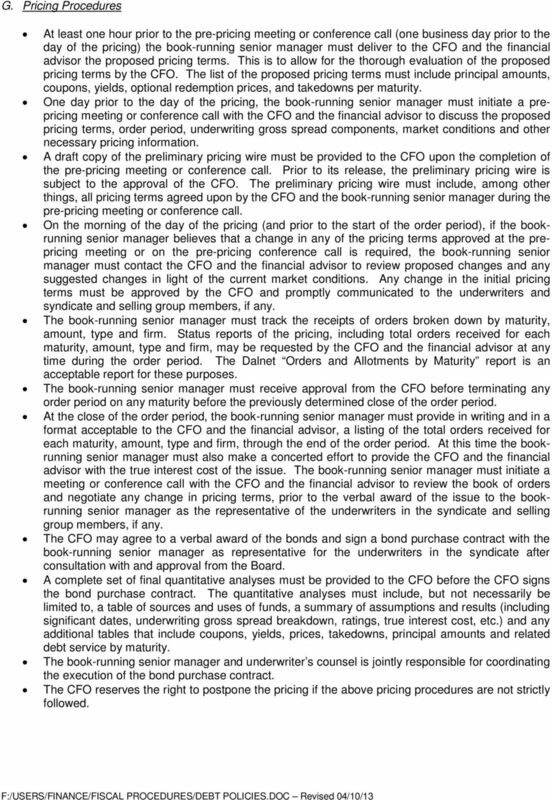 On the morning of the day of the pricing (and prior to the start of the order period), if the bookrunning senior manager believes that a change in any of the pricing terms approved at the prepricing meeting or on the pre-pricing conference call is required, the book-running senior manager must contact the CFO and the financial advisor to review proposed changes and any suggested changes in light of the current market conditions. Any change in the initial pricing terms must be approved by the CFO and promptly communicated to the underwriters and syndicate and selling group members, if any. The book-running senior manager must track the receipts of orders broken down by maturity, amount, type and firm. Status reports of the pricing, including total orders received for each maturity, amount, type and firm, may be requested by the CFO and the financial advisor at any time during the order period. The Dalnet Orders and Allotments by Maturity report is an acceptable report for these purposes. The book-running senior manager must receive approval from the CFO before terminating any order period on any maturity before the previously determined close of the order period. At the close of the order period, the book-running senior manager must provide in writing and in a format acceptable to the CFO and the financial advisor, a listing of the total orders received for each maturity, amount, type and firm, through the end of the order period. At this time the bookrunning senior manager must also make a concerted effort to provide the CFO and the financial advisor with the true interest cost of the issue. 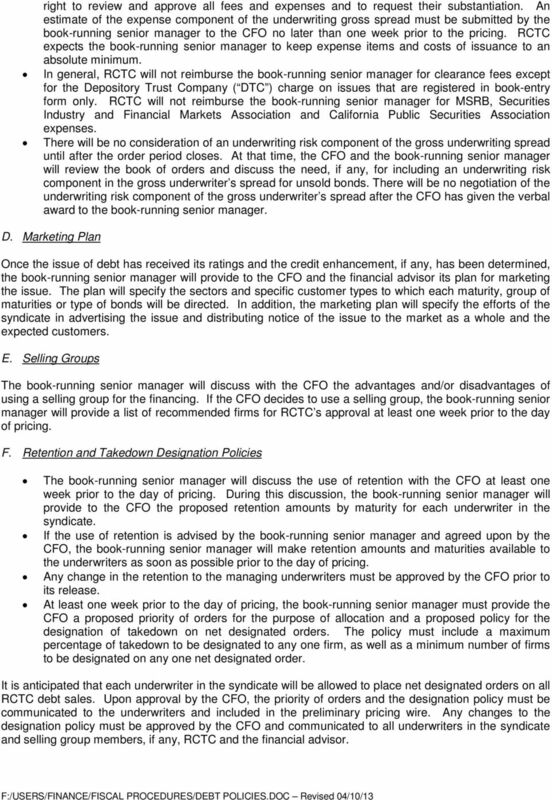 The book-running senior manager must initiate a meeting or conference call with the CFO and the financial advisor to review the book of orders and negotiate any change in pricing terms, prior to the verbal award of the issue to the bookrunning senior manager as the representative of the underwriters in the syndicate and selling group members, if any. The CFO may agree to a verbal award of the bonds and sign a bond purchase contract with the book-running senior manager as representative for the underwriters in the syndicate after consultation with and approval from the Board. A complete set of final quantitative analyses must be provided to the CFO before the CFO signs the bond purchase contract. The quantitative analyses must include, but not necessarily be limited to, a table of sources and uses of funds, a summary of assumptions and results (including significant dates, underwriting gross spread breakdown, ratings, true interest cost, etc.) and any additional tables that include coupons, yields, prices, takedowns, principal amounts and related debt service by maturity. The book-running senior manager and underwriter s counsel is jointly responsible for coordinating the execution of the bond purchase contract. The CFO reserves the right to postpone the pricing if the above pricing procedures are not strictly followed. 10 strategy for the initial sale and subsequent frequent roll-over of commercial paper amounts and maturities shall take into account the short-term yield curve as well as RCTC s philosophy to have a significant number of diverse commercial paper investors. The CFO may require RCTC s commercial paper dealers to provide quarterly and annual reports detailing the commercial paper average cost, average maturity and a list of commercial paper investors. Subject to the approval of its liquidity and/or letter-of-credit provider, RCTC reserves the right to change the number of commercial paper dealers for the commercial paper program. L. REFUNDING OPPORTUNITIES An advance refunding involves refunding bonds in advance of the bond s first optional redemption date. An advance refunding is an important debt management tool for RCTC. Advance refundings are commonly used to achieve interest cost savings, remove or change burdensome bond covenants or to restructure future debt service payments. Advance refundings are limited by federal tax law and must be used judiciously. 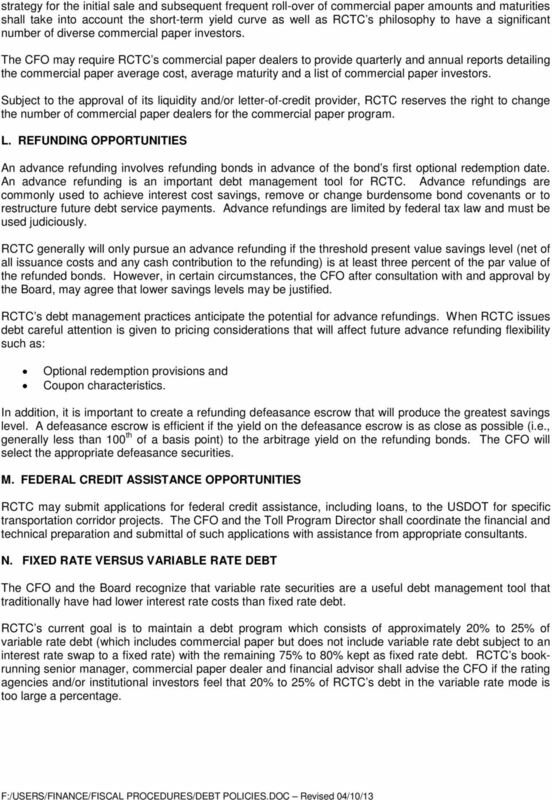 RCTC generally will only pursue an advance refunding if the threshold present value savings level (net of all issuance costs and any cash contribution to the refunding) is at least three percent of the par value of the refunded bonds. However, in certain circumstances, the CFO after consultation with and approval by the Board, may agree that lower savings levels may be justified. RCTC s debt management practices anticipate the potential for advance refundings. When RCTC issues debt careful attention is given to pricing considerations that will affect future advance refunding flexibility such as: Optional redemption provisions and Coupon characteristics. In addition, it is important to create a refunding defeasance escrow that will produce the greatest savings level. A defeasance escrow is efficient if the yield on the defeasance escrow is as close as possible (i.e., generally less than 100 th of a basis point) to the arbitrage yield on the refunding bonds. The CFO will select the appropriate defeasance securities. M. FEDERAL CREDIT ASSISTANCE OPPORTUNITIES RCTC may submit applications for federal credit assistance, including loans, to the USDOT for specific transportation corridor projects. The CFO and the Toll Program Director shall coordinate the financial and technical preparation and submittal of such applications with assistance from appropriate consultants. N. FIXED RATE VERSUS VARIABLE RATE DEBT The CFO and the Board recognize that variable rate securities are a useful debt management tool that traditionally have had lower interest rate costs than fixed rate debt. RCTC s current goal is to maintain a debt program which consists of approximately 20% to 25% of variable rate debt (which includes commercial paper but does not include variable rate debt subject to an interest rate swap to a fixed rate) with the remaining 75% to 80% kept as fixed rate debt. RCTC s bookrunning senior manager, commercial paper dealer and financial advisor shall advise the CFO if the rating agencies and/or institutional investors feel that 20% to 25% of RCTC s debt in the variable rate mode is too large a percentage. 11 O. DERIVATIVES RCTC will continue to explore the use of derivative products as appropriate and in accordance with the Investment Policy and the Swap Policy, provided that the derivative products: Hedge variable rate debt exposure, Lower interest rate costs, or Minimize risks to RCTC. Although RCTC may enter into swap agreements, including fixed to variable rate swap agreements, derivative products for debt shall not be used for the purpose of interest rate speculation. The CFO has the sole responsibility for determining which prospective debt products for new issue debt are derivatives. Derivative products debt instruments may be incorporated into RCTC s debt program only after the CFO has informed the Executive Director and the Commissioners of the purpose and the risks associated with the derivative product debt instruments including but not limited to: Interest rate risk, Counterparty credit risks, Termination risks, and Tax implications. If appropriate, the CFO, after consultation and approval by the Board, may determine a minimum level of savings required before implementing a derivative product debt instrument. If the Commission authorizes the use of derivative products, the CFO will provide the Commissioners within twenty-four hours with a memo detailing any activity related to the use of derivative products. P. PRIMARY AND SECONDARY MARKET DISCLOSURE Trustees have been appointed for the benefit of the Measure A Sales Tax Revenue Bonds and the Toll Revenue Bonds and related TIFIA Loan. Each trustee shall perform all functions and duties required under the terms and conditions set forth in the respective indentures and/or federal loan agreements. The CFO will recommend changes as appropriate. In addition to the responsibilities required by the respective indentures and federal loan agreements, RCTC has a commitment to continuing to disclose material information after the sale of its debt. The CFO is responsible for implementing and managing RCTC s legal and professional commitment to continuing to disclose material information after the sale of its debt. In adherence to Securities and Exchange Commission Rule 15c2-12(b)(5), the Commission s Continuing Disclosure Agreement with each trustee or disclosure dissemination agent, as applicable, agrees to provide its Annual Report and notice of listed events to the MSRB, for dissemination to interested parties. Listed events are defined as: 1. Principal and interest payment delinquencies; 2. Non-payment related defaults; 3. Unscheduled draws on the debt service reserve funds reflecting financial difficulties; 4. Unscheduled draws on credit enhancements reflecting financial difficulties; 5. Substitution of credit or liquidity providers, or their failure to perform; and 6. Adverse tax opinions or events affecting the tax-exempt status of the security; 7. Modifications to rights of security holders; 8. Contingent or unscheduled bonds calls; 9. Defeasances; 10. Release, substitution or sale of property securing the payment of any security; and 11. Rating changes. 13 Copy of all contracts and arrangements involving private or unrelated use of the debt financed assets; and Copies of all records of investments, investment agreements, arbitrage reports and underlying documents, including trustee statements. The CFO, or its designee, will also assure compliance with IRS tax return filing requirements. T. RATING AGENCIES The CFO is responsible for implementing and managing RCTC s rating agencies relations program. The CFO recognizes the importance of immediate and timely disclosure of relevant financial and program information concerning each of RCTC s debt programs to the rating agencies. The CFO shall promptly respond to any inquiry from any rating agency analyst. In addition, the CFO and/or the Executive Director and one or more representatives of RCTC s Commissioners shall periodically meet with the rating agencies in order discuss RCTC s proposed debt financings and/or recent financial results, financial projections, Board policy, specific RCTC programs such as Measure A and tolling activities as well as the general economy in Riverside County and Southern California and other matters. U. INVESTOR RELATIONS The CFO is responsible for implementing and managing RCTC s investor relations program. The CFO shall make every attempt to promptly respond to any inquiry from an institutional or retail investor. In addition, the CFO shall periodically attempt to meet with key institutional investors in order to familiarize the institutional investors with RCTC s financial history and financial projections. 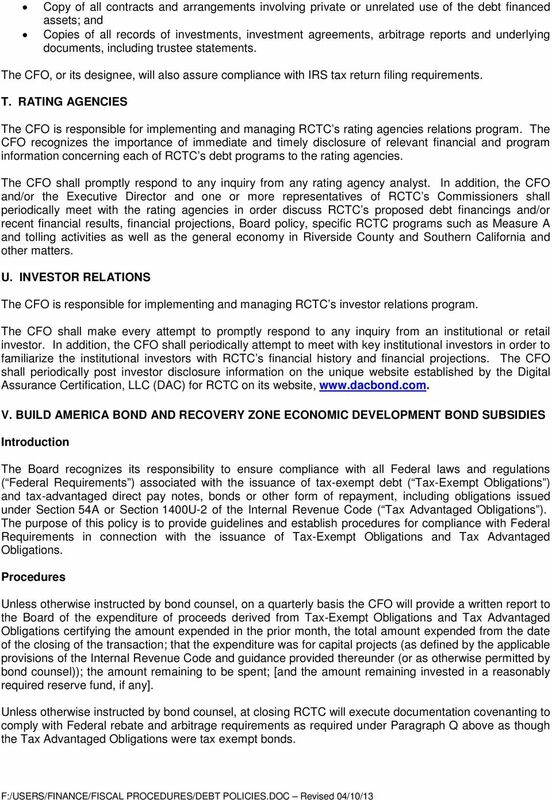 The CFO shall periodically post investor disclosure information on the unique website established by the Digital Assurance Certification, LLC (DAC) for RCTC on its website, V. BUILD AMERICA BOND AND RECOVERY ZONE ECONOMIC DEVELOPMENT BOND SUBSIDIES Introduction The Board recognizes its responsibility to ensure compliance with all Federal laws and regulations ( Federal Requirements ) associated with the issuance of tax-exempt debt ( Tax-Exempt Obligations ) and tax-advantaged direct pay notes, bonds or other form of repayment, including obligations issued under Section 54A or Section 1400U-2 of the Internal Revenue Code ( Tax Advantaged Obligations ). The purpose of this policy is to provide guidelines and establish procedures for compliance with Federal Requirements in connection with the issuance of Tax-Exempt Obligations and Tax Advantaged Obligations. Procedures Unless otherwise instructed by bond counsel, on a quarterly basis the CFO will provide a written report to the Board of the expenditure of proceeds derived from Tax-Exempt Obligations and Tax Advantaged Obligations certifying the amount expended in the prior month, the total amount expended from the date of the closing of the transaction; that the expenditure was for capital projects (as defined by the applicable provisions of the Internal Revenue Code and guidance provided thereunder (or as otherwise permitted by bond counsel)); the amount remaining to be spent; [and the amount remaining invested in a reasonably required reserve fund, if any]. 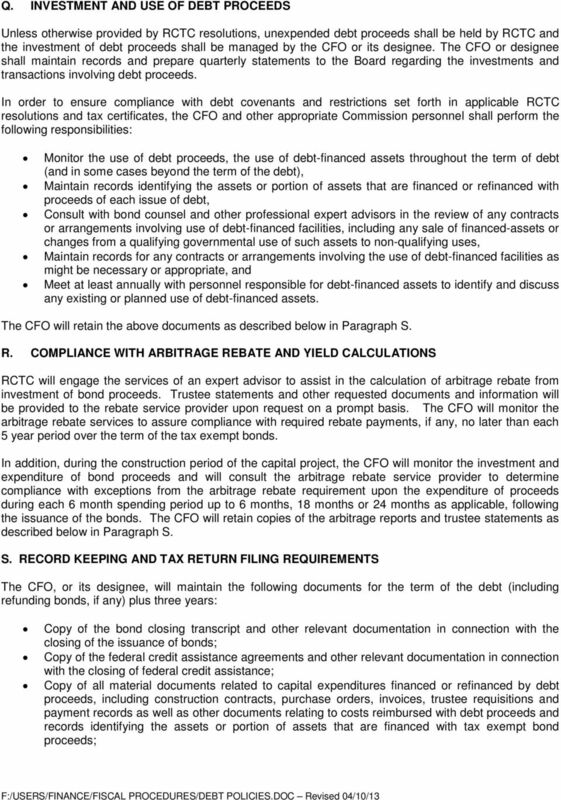 Unless otherwise instructed by bond counsel, at closing RCTC will execute documentation covenanting to comply with Federal rebate and arbitrage requirements as required under Paragraph Q above as though the Tax Advantaged Obligations were tax exempt bonds. 15 NASD operates in municipal securities according to a special set of municipal bond rules written by the MSRB. Net Designated Order: An order for bonds submitted by a syndicate member in which all or a portion of the takedown is to be credited to firms designated by the purchaser of the bonds according to relative designated by the said purchaser. Priority Order: A retail or a net designated order. Retail Order: An order for bonds placed by an individual or, as determined by the CFO, a retail order may also include an order placed by a bank trust department or an investment advisor for an individual. 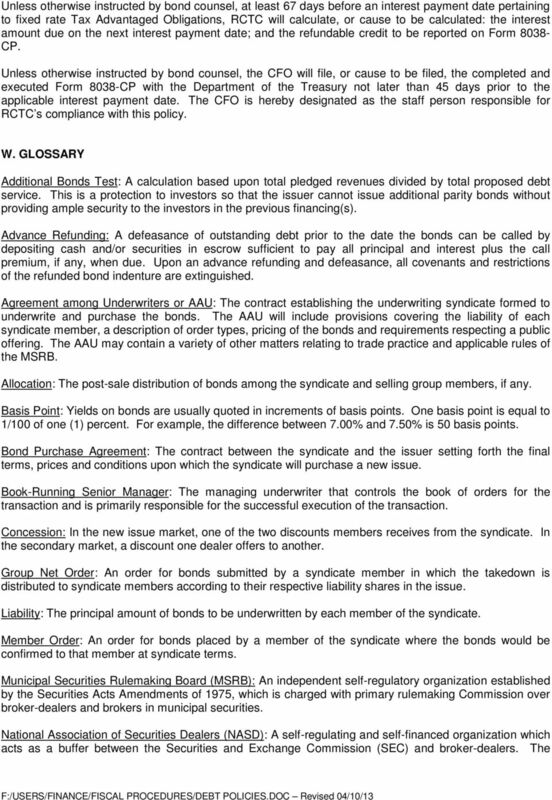 Retention: An amount of bonds that will be guaranteed to be available for sale by each member of the syndicate. 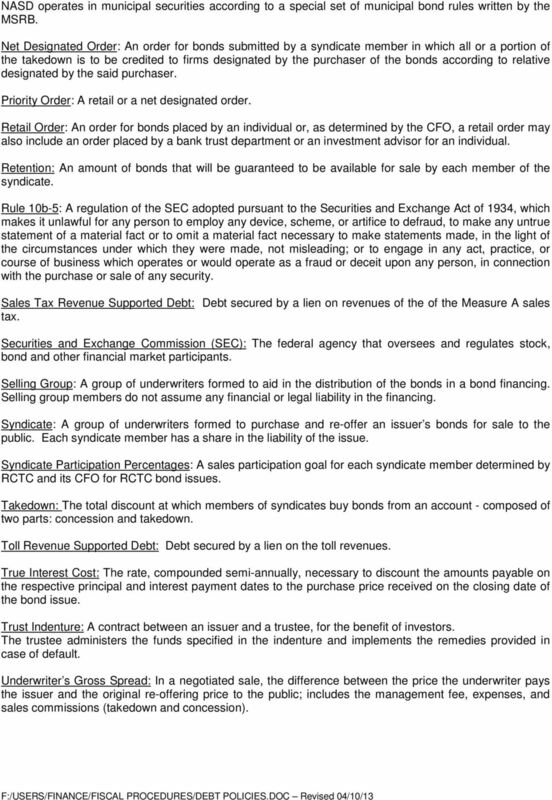 Rule 10b-5: A regulation of the SEC adopted pursuant to the Securities and Exchange Act of 1934, which makes it unlawful for any person to employ any device, scheme, or artifice to defraud, to make any untrue statement of a material fact or to omit a material fact necessary to make statements made, in the light of the circumstances under which they were made, not misleading; or to engage in any act, practice, or course of business which operates or would operate as a fraud or deceit upon any person, in connection with the purchase or sale of any security. Sales Tax Revenue Supported Debt: Debt secured by a lien on revenues of the of the Measure A sales tax. Securities and Exchange Commission (SEC): The federal agency that oversees and regulates stock, bond and other financial market participants. Selling Group: A group of underwriters formed to aid in the distribution of the bonds in a bond financing. Selling group members do not assume any financial or legal liability in the financing. 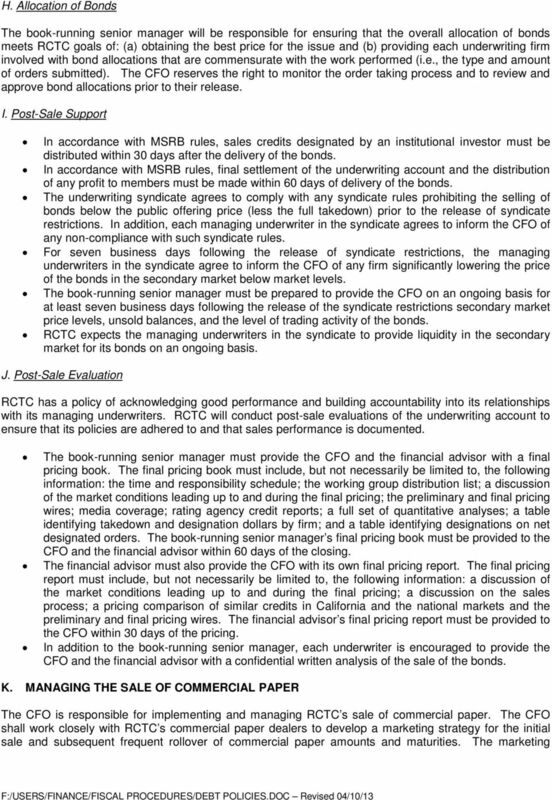 Syndicate: A group of underwriters formed to purchase and re-offer an issuer s bonds for sale to the public. Each syndicate member has a share in the liability of the issue. Syndicate Participation Percentages: A sales participation goal for each syndicate member determined by RCTC and its CFO for RCTC bond issues. Takedown: The total discount at which members of syndicates buy bonds from an account - composed of two parts: concession and takedown. Toll Revenue Supported Debt: Debt secured by a lien on the toll revenues. True Interest Cost: The rate, compounded semi-annually, necessary to discount the amounts payable on the respective principal and interest payment dates to the purchase price received on the closing date of the bond issue. Trust Indenture: A contract between an issuer and a trustee, for the benefit of investors. The trustee administers the funds specified in the indenture and implements the remedies provided in case of default. Underwriter s Gross Spread: In a negotiated sale, the difference between the price the underwriter pays the issuer and the original re-offering price to the public; includes the management fee, expenses, and sales commissions (takedown and concession).